If you, your employees or your clients have to walk onto potentially wet, slippery surfaces, you need the stability and peace of mind of wholesale bath mats. 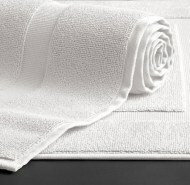 At Towel Super Center, we offer high-quality bath mats at low wholesale prices. Not only are they competitively priced, but they’re ideal for regular use. Order your favorite wholesale bath mats in the quantity you need. Remember that with us as your bath mat and towel supplier, the more units you need, the lower your per-mat cost. You might not think that some of the following companies could use wholesale bath mats. However, they all have a need for bath mats that are dependable and durable. Hotels, Motels and Bed and Breakfasts: Your guests want to step out of the shower onto a warm, cushiony cotton bath mat, not a hard linoleum floor. Protect their feet as well as your flooring with wholesale bath mats that wash and dry rapidly, leaving you with a constant supply of ready-to-use products. Medical Facilities: Many medical facilities have private and semi-private bathrooms for staff members and patients. Be sure you include a supply of clean, comfortable bath mats for everyone’s use. Think you want to maximize the sanitizing of your bath mats by cleaning them with bleach? White wholesale bath mats will be perfect. Dorms and Other Campus Living Spaces: The students on your educational campus, whether it’s a boarding school or a university, will be using showers and shower stalls. Even if you have textured flooring to reduce the risk of a slip and fall, you should consider supplying students with bath mats, too. At our economical prices, you won’t break your budget with this precautionary safety item. Gyms, Health Clubs and Country Clubs: Whenever you have people who are exercising at a facility, you’re probably going to have showers — and that means the floors will inevitably get and stay damp for extended periods. Many patrons will be pleasantly surprised when you offer them a complimentary bath mat to use so their feet don’t get wet after leaving a shower stall or large shower facility. Pools. Do you operate a public pool? A private pool? A pool at a hotel or other tourist-type establishment? Bath mats can be added as safety features. Hand out a bath mat and bath towel to every patron and decrease the amount of moisture that pools on the floor. Car Washes and Pet Washes: Any place where you’re working with water creates and opportunity for people to use bath mats. Our wholesale bath mats come in pristine white, which you can keep sparkling — even if they get dirty — by using a bleach or bleach alternative when laundering. Why chance running out of the bath mats you require to keep up a high level of customer service? Towel Super Center is ready to ship your next order right to your business quickly.